There’s no better time for brass than the holidays! Now a family tradition for many audiences, Copper Street Brass’ popular holiday concert celebrates the stories and sounds of the season. You’ll hear everything from traditional carols and classical music to funk and rock holiday tunes – crafted with Copper Street’s signature original arrangements and performed with passion, humor, and virtuosity. You’ll also hear music from favorite childhood movies and TV specials like The Nutcracker, The Snowman, A Charlie Brown Christmas, and The Grinch. One night only, Friday December 8th at 7:30 PM – St. John’s Lutheran Church. Tickets $20-$25 adults, $10 students. 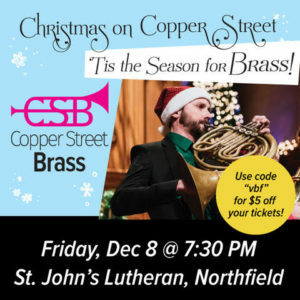 Tickets available at www.copperstreetbrass.org or call (763) 307-3452. VBF fans use code “vbf” for $5 off your advance tickets! 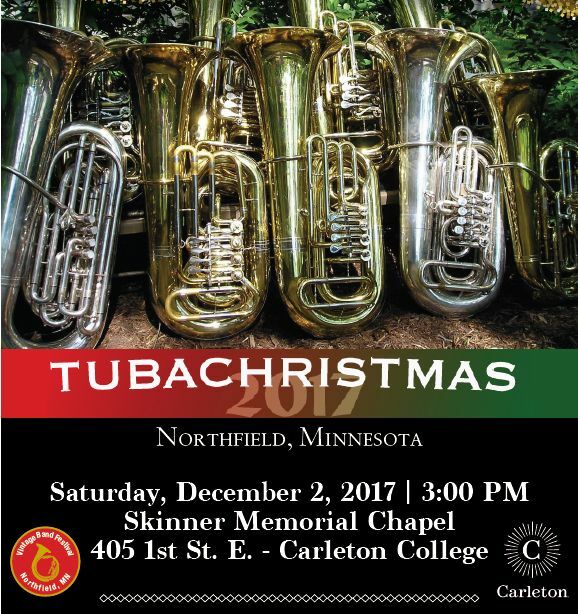 Final Reminder: Tuba Christmas will take place Saturday, December 2! Kick off the holiday season on Saturday, December 2, by going to Tuba Christmas at Skinner Memorial Chapel on the campus of Carleton College at 3pm. Picture a stage filled with tubas, sousaphones, euphoniums and baritones all playing Christmas carols for your enjoyment. Be prepared to sing along as instructed by host, Paul Niemisto, and guest conductor, Ron Rodman, and be sure to bring your family and friends to this community celebration. If you know musicians that play these instruments, invite them to participate. Musicians of all ages are welcome. Registration begins at noon, there is a rehearsal at 1pm and the performance is at 3pm. Visit vintagebandfestival.org for more details. This entry was posted in VBF Bands, VBF News and tagged Christmas on Copper Street, Copper Street Brass, St. John's Lutheran Church, Vintage Band Festival on November 28, 2017 by Dan Bergeson. Northfield, Minnesota—Vintage Band Festival is pleased to announce that it has received a $3,000 grant from the Southeastern Minnesota Arts Council (SEMAC) in support of one of the performing bands at this summer’s one-day festival on July 29. The award also covers expenses for sound production at the event. SEMAC has been a strong supporter and advocate for Vintage Band Festival since the festival was launched in 2006 and this recent grant continues that tradition. Vintage Band Festival was founded in 2006 by Dr. Paul Niemisto, at the time a faculty member of the St. Olaf College Music Department. The inspiration for staging a series of brass and wind band concerts simultaneously at multiple outdoor venues in Northfield, Minnesota came from observing similar events while visiting small towns in Germany and Austria. The local community responded enthusiastically to the idea and Vintage Band Festival is now a thriving and beloved ongoing enterprise in Northfield. Four-day festivals have been held in 2006, 2010, 2013 and 2016. Recently, a variation on the concept was created and now one-day summer events are staged during the intervals between the grand four-day events. The next one-day Vintage Band Festival will be held July 29, 2017. This entry was posted in Grant Awards, VBF News and tagged Paul Niemisto, Southeastern Minnesota Arts Council, St. Olaf College, Vintage Band Festival on May 22, 2017 by Dan Bergeson. Northfield, Minnesota—The Northfield Eagles Club will be hosting a benefit spaghetti dinner as a fundraiser for Vintage Band Festival 2017. The event will take place, Saturday, April 22, 2017 from 5:00pm – 7:30 pm at the Fraternal Order of the Eagles Club, 304 Water Street South, Northfield. Dinner will consist of spaghetti with marinara sauce and parmesan cheese, salad and sliced bread. Cash bar will be available and live music will be presented throughout the evening, beginning at 5:30. 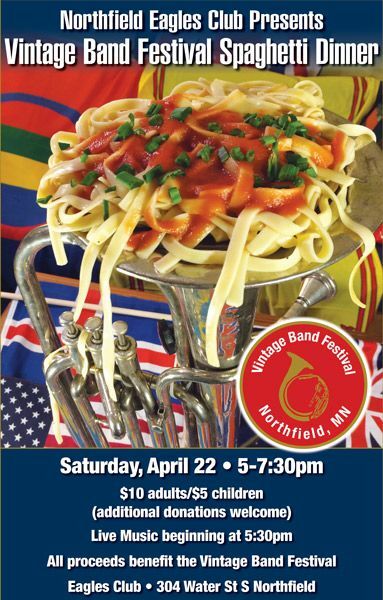 Tickets for the Vintage Band Festival spaghetti benefit dinner are available in advance at Coldwell Banker South Metro Office, 419 Division Street South, Northfield. Tickets are $10 for adults and $5 for children. Tickets may also be purchased at the door the night of the event. All proceeds from the event will benefit Vintage Band Festival. Vintage Band Festival 2017 will take place in Northfield July 29, 2017. Music will run from 10am-10pm in Bridge Square. Details of the 2017 festival can be found at www.vintagebandfestival.org. This entry was posted in Fundraising, VBF News and tagged Northfield Eagles Club, Vintage Band Festival on April 1, 2017 by Dan Bergeson. 2013 was the best Vintage Band Festival yet. Bands from Sweden, Germany, Austria, Texas, Chicago, Maryland, Michigan, Texas, Wisconsin, and Minnesota converged on Northfield Minnesota for 5 days of intense brass wind music. Artistic director Paul Niemisto designed the festival to showcase vintage brass music, and to highlight the best of contemporary brass music from New Orleans jazz to Chicago shout bands to professional European brass ensembles. Bringing all these together in one place makes the Vintage Band Festival unique in North America. VBF 2013 was exponentially larger than either of the previous festivals. 35 bands provided a combined total of 134 unique musical experiences. In 2010, concerts were staged in seven communities beyond Northfield. For 2013 we added six more towns to make a total of 13: Faribault, New Ulm, Cannon Falls, Red Wing, Chatfield, New Prague, Minneapolis, Scandia, St. Peter, Owatonna, Nerstrand, Montgomery and Kasota. Staffing for VBF 2013 followed a similar format to the previous two festivals, though more people were required due to the increase in the number of band, communities and events. A platoon of volunteers run the festival, ably coordinated this year by our omni-competent St. Olaf College interns Mitch Evett and Ramsey Walker. The VBF website was completely redesigned to give concert-goers far more information. The online event schedule was transformed into an interactive experience complete with a biography of each band, a photo of the band and a Google map showing directions to the concert location. An additional Google map displayed all of the concert locations and directions to each one. Free audio samplers of most of the bands were made available using the SoundCloud service. Artistic growth has exceeded our administrative infrastructure and fundraising ability, which needs to grow to match our artistic reach. We need to recruit board members with specific skills, add to our administrative structure, and pay off about $50,000 in accumulated debt from the three Vintage Band Festivals. We feel we are at a not-unexpected place for a young festival. We believe we are at a not-unexpected place in our organizational life. We have established a successful festival unique in North America, and now need to build additional organizational infrastructure to support it. We believe the $170,000 we spent this year is a reasonable budget to put on a festival of this caliber, and we also believe we can raise that level of support for each festival going forward, given the dedicated audience we have built. Recruit additional board members with specific skills in finance, administration, and fundraising. Improve our communication with and outreach to friends and donors. Establish an annual giving club – our very own “Band-aid” to support VBF in planning as well as in festival years. Extinguish the approximately $50,000 in debt we have accumulated. Hire our first part time administrator to manage preparations for the festival. Program and present the 4th, and best yet, Vintage Band Festival 2016. Board members with specific skills in finance, administration, and fundraising. If you would like to nominate someone or volunteer, please let us know. Friends who will consider holding part of our accumulated deficit as no-interest loans for a period of two years while we negotiate payments and increase our fundraising capacity. Dedicated supporters who will pledge an annual gift to the Vintage Band Festival so we have adequate planning funds in the off years. We especially appreciate annual gifts of $100, $500, or even $1,000 which can help us build a reliable income. Gifts of any amount now so we can build up an advance reserve fund for the 2016 Vintage Band Festival. Thank you for your past support of the Vintage Band Festival. You, our friends and audience, are a vital part of the Vintage Band Festival experience. This entry was posted in VBF Bands, VBF News and tagged Paul Niemisto, Vintage Band Festival on December 7, 2013 by Dan Bergeson. This entry was posted in VBF News and tagged Civil War, cotillion dance, Dan Bergeson, Hypnotic Brass Ensemble, Kenny Carr and the Tigers, Kentucky Baroque Trumpets, Lincoln, Medevi Brunnsorkester, Niemisto, Paul Maybery, St. Olaf College, Steven Spielberg, Vintage Band Festival on July 28, 2013 by Paul Niemisto. The Vintage Band Festival was recently mentioned in the Rochester Post-Bulletin. Read the article here. This entry was posted in VBF News and tagged 26th North Carolina Regimental Band, Ameriikan Poijat, Buffalo Bill's Wild West Band, Century Brass Band, Civil War, Eine Kleine DorfMusik Kapelle, First Brigade Band, Hypnotic Brass Ensemble, Medevi Brunnsorkester, music, New Ulm Original German Band, Newberry's Victorian Cornet Band, Oktetten Ehstedts Eftr, Original Drachenfelser Musikanten, Paul Niemisto, Rochester, Vintage Band Festival on July 27, 2013 by Paul Niemisto. The Vintage Band Festival was recently mentioned in Minnesota Monthly as one of the top music events to attend this coming month, Aug. 1-4, under their calendar section titled, “The Agenda – What you need to do, see, and hear this month.” You can also read a full article on the upcoming festival here, compliments of writer Joel Schettler, of Minnesota Monthly’s Minnesota Journeys. This entry was posted in VBF News and tagged Vintage Band Festival on July 25, 2013 by Paul Niemisto. Visit our press page for information on a special Media Day and more. NORTHFIELD, MN, July 2013 – Time will stand still as the Vintage Band Festival takes the stage Aug. 1-4 with a multitude of period-inspired performances celebrating the music and instruments of past eras. More than 100 concerts will take place this summer in Northfield and surrounding satellite concert sites for an unforgettable experience recalling music in history. Festival-goers will be able to step back in time and experience a musical documentary, of sorts, all in one weekend. “The whole town becomes a theater set,” said Festival’s Artistic Director Dr. Paul Niemisto, describing the bands’ different genres and ethnicities to be represented at open-air venues of parks, pubs, restaurants and other public spaces. “It’s not only the music, period instruments and authentic costumes viewers will be experiencing – we’re playing the space.” For example, attendees to the free festival can witness Civil War reenactment bands, dressed in period clothing, using restored instruments at a Battle of the Bands across the Cannon River followed by a massed concert. The Vintage Band Festival serves as a portal into different eras with additional auxiliary events offered, such as ballroom dancing, a vintage “base ball” game, vaudeville entertainment and more. This larger-than-life musical event spans the centuries, from primitive pieces to classic arrangements to old-time favorites to present-day smash hits, and it bridges across the country and overseas with more than 30 bands participating. The Kentucky Baroque Trumpets will be performing signal calls dating back to 1240 from Krakow, Poland. This band offers a series of cavalry fanfares, solos, and duets, primarily from the 1600 and 1700s and has just recently recorded, for the first time ever, and with some of the finest trumpeters in the world, a facsimile from Composer Cesare Bendinelli that was transcribed into modern notation, according to Kentucky Baroque’s Artistic Director Don Johnson. Progressing along the musical timeline, the Copper Street Brass Quintet out of the Twin Cities has a tour program called the “Evolution of the Brass Quintet” that is aimed at education and offered to communities across the nation. For a complete band roster, go to http://vintagebandfestival.org/bands/. Music samplers and a full event schedule can be found at vintagebandfestival.org. Press information can be found at http://vintagebandfestival.org/press/. 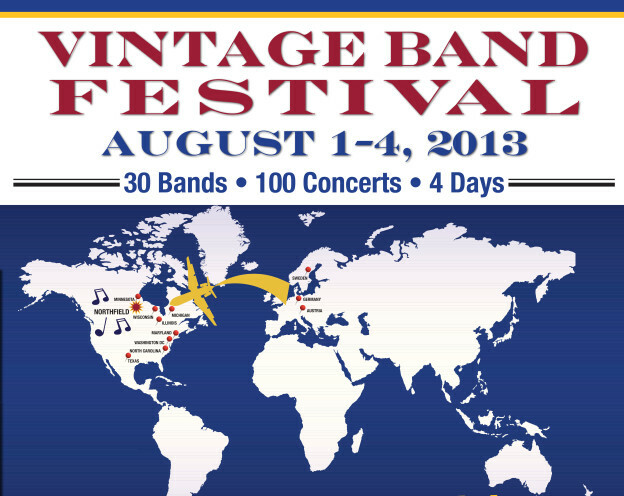 Find VBF on Facebook at “Vintage Band Festival” and Twitter at @vintagebandfest. Festival inquiries and photo requests, contact Amy Acheson at 651-470-0028 or amy@achesoncreative.com. This entry was posted in 2013 Press & Ticket info and tagged Brass Messengers, Civil War, Copper Street Brass Quintet, Eine Kleine DorfMusik Kapelle, Hypnotic Brass Ensemble, Kenny Carr and the Tigers, Kentucky Baroque Trumpets, Klezmerica, Mariachi mi Tierra, Medevi Brunnsorkester, Oktetten Ehnstedts Eftr., Original Drachenfelser Musikanten, Paul Niemisto, Vintage Band Festival on June 30, 2013 by Paul Niemisto.